Again you might blame my writers’ club colleague, Jo Campbell, for this story. But not completely. The 17/18 years old students (at Liceul Tehnologic ‘Nicolae Nanu’, Broșteni, Neamț, Romania) of my former Romanian student, Paula, now herself a teacher of English, so liked my ‘dark’ 5th November story, which was prompted by Jo, I promised to write another for them. Unusually, I have written to the theme given for readings at today’s meeting of our club, Writing on the Wharfe. She had been meticulous as far as her diary was concerned. By ‘diary’ I mean journal, not a place to note appointments, meetings or other dates and times to be remembered. The journal was completed over morning tea each day, relating the most important, to her, happenings of the previous day. 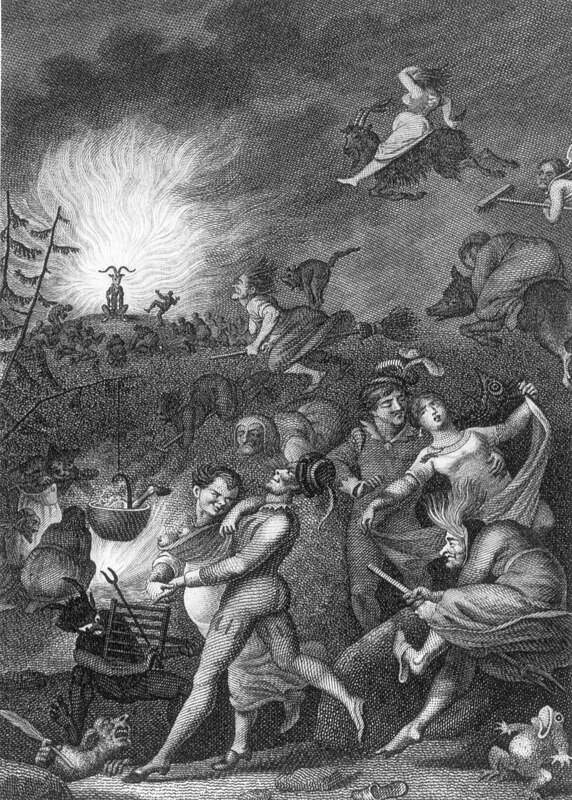 She had noted, on the page for 30th April, ‘St Walburger, witches’ sabbath!’. Born close to the Brocken in Germany, she had always observed this feast. But, and it’s a big but, Richard, the name of the love of her life she has declared, has never appeared in the journal. ‘My love’, yes; ‘he’ or ‘him’, perhaps; but never the name – Richard. 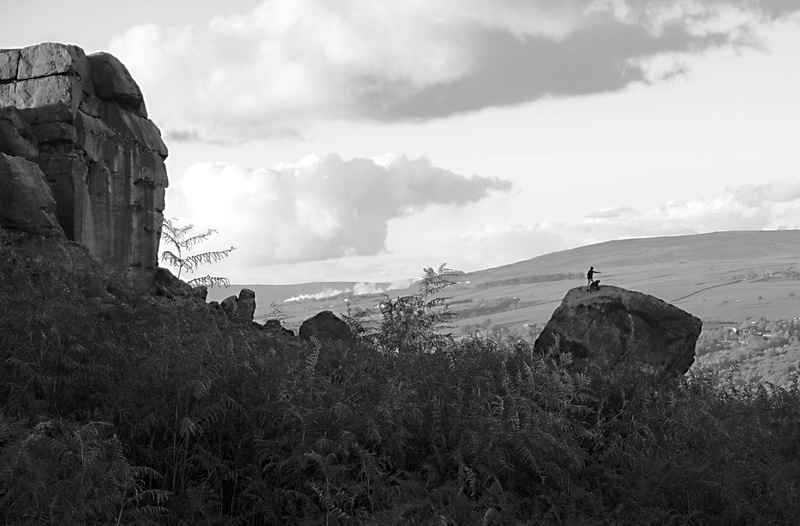 It began one day when, as the sun was setting, she and Richard visited the famous Cow and Calf rocks on Ilkley Moor, in Yorkshire. Not satisfied with standing on the larger ‘cow’ and admiring the superb view over the town of Ilkley and the Wharfe Valley, they descended with a mixture of runs and jumps to the ‘calf’ below. Giggling, they scrambled to the top of the smaller rock and lay out in the fading sun. “I’m not so sure that’s a good idea. Isn’t it better to leave the rocks as nature intended?” Heidi was a keen environmentalist. “One more won’t make much difference; there are so many on all the rocks,” Richard answered as he began to scratch the rock with a knife he always carried. he hesitated as the knife met some resistance from an inclusion harder than the surrounding rock. Exasperated, he put his whole weight behind the blade, lost his balance and tumbled down to the ground. Eventually the air ambulance arrived – two broken legs, a broken collar bone and a dislocated neck kept him in hospital for several weeks. The following 30th of April, 2016, early evening, found the couple wandering through the New Forest hand-in-hand in the twilight. As trees began to assume fantastic shapes in the fading light, an impressive oak, its trunk of a girth which the two lovers could not encircle with their outstretched arms, made them stop and rest, backs against the rough but somehow comfortable majesty supporting the now leafy branches above. “I’m going to carve our names here so this tree will remember us,” Richard announced. a large gasp broke the concentrated silence as the knife slipped to make a deep gash in his left wrist. Blood, so much blood, fountained from the cut, obliterating the carved letters before covering Heidi’s breast. Quick thinking, she ripped off her blood-soaked shirt and applied a tourniquet. Nevertheless, Richard lapsed into unconsciousness and the paramedics, who arrived quickly following Heidi’s desperate phone call, told her he was lucky to be alive and would not be were it not for her prompt action. One year later, 30th April 2017, found the couple on the Brocken, following a visit to Heidi’s parents. They didn’t take the steam train up to the highest peak in the Harz mountains but decided to walk, though there were vestiges of snow on the peak. About half way up they left the road, found a clearing among the pines and sat to eat their picnic. Richard lit the tiny light-weight gas stove and poured bottled water into the small pan they had brought to make a warming tea. “This is a magical place my love; I’m so glad you brought me here.” Richard wasn’t usually so easily impressed. “You just be careful; it is a magical place but it’s witches’ magic, not fairies’ magic,” Heidi warned him. “Oh you and your superstitions. I don’t believe a word of it. Anyway, it’s beautiful. I’m going to carve our names in the dry turf here,” he finished, pulling out his knife. “Please don’t. Just leave it as nature intended,” Heidi pleaded. But Richard had already completed her name and the first six letters of his own. Turning quickly, his elbow caught the little stove and it was on its side, setting the dry turf alight. A forest ranger found them in a tight embrace.